A slightly edited version of this article was originally published in the September, 1989 issue of Monitoring Times magazine. Huancabamba, Mendoza, Rioja, Juanjui, Santa Cruz, Cutervo, Chota, Bambamarca, Huamachuco . . . the radio towns of northern Peru number three or four dozen. For the most part, these towns are provincial (county) capitals with 5,000 to 15,000 inhabitants. They are commercial centers for the surrounding villages and farms, although a few like Huamachuco depend on mining. There is little unique about any of them. Celendin, a typical northern Peruvian town, lies about a hundred kilometers east of the city of Cajamarca (52k jpeg photo of city), five hours by dirt road on the local bus. One sixth of the province's 70,000 inhabitants live here. The Catholic church towers over the central Plaza de Armas. As in many Peruvian towns, gardeners trim the plaza's shrubbery into animals and geometric shapes. Celendin's dirt streets are flanked by one and two story buildings of adobe or cement block, roofed with moss-covered clay tiles. The scattered business district is comprised of several general stores, a few basic and somewhat rundown hotels, the bus company office, and a couple restaurants and bars. At 8,500 feet above sea level, the surrounding Andean valley is one of the garden spots of northern Peru. Although some small scale gold, silver, and copper mining is done in the nearby mountains, it is agriculture that keeps Celendin prosperous. The climate is perfect for growing potatoes and barley, and for raising dairy cattle and sheep. Celendin is known throughout the region as the best producer of manjar blanco, a rich soft caramel made by slowly boiling milk and sugar. The sweet is spread on bread and used to fill pastries. Manjar blanco and other produce is trucked to the coastal city of Trujillo. Peruvian towns often have a special handicraft, and Celendin is no exception. When a campesina (peasant woman) isn't cooking or cleaning, her hands may be busily weaving a purse, a hat, or a small basket out of thin straw called paja. The plant is cultivated because the handicrafts bring extra income to the peasant households. Some paja products are sold to stores in Celendin, but most are sold in Cajamarca tourist shops. 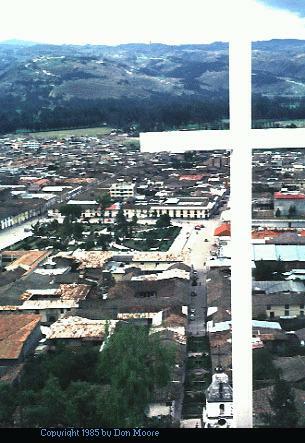 Celendin is the staging point for journeys from Cajamarca to Peru's northern interior. Buses don't make the trip, but for a small fee it's easy to hitch a ride to Chachapoyas on one of the frequent cattle trucks. The two day journey involves extremes of temperture and road conditions: either clouds of dust or rivers of mud, depending on the season. But, if one endures the ride, it's easy to continue on from Chachapoyas to Rioja, Moyobamba, and Tarapoto. Since June 1982, when Radio Moderna, 4300 khz came on the air, Celendin has been a DX target. Though the history of radio here has been rocky, Celendin has, in fact, been more active on shortwave than most of the other towns of the region. The town has one of the strongest municipal generators in Cajamarca department. Unlike many other places where the municipal generators can't power radio stations, potential stations in Celendin don't have the added expense of buying their own generator. This has, however, restricted their broadcasting hours. Since the generator is only on from 6 pm to midnight (2300-0500 UTC), all of Celendin's stations follow that limited schedule. Not long after Radio Moderna came on the air, Radio Celendin appeared on 7054 khz. Celendin's third station, Radio Gran Pajaten, got its start in mid-1983, on a highly variable frequency of around 4180 khz. Radio Nuevo Eden broadcast briefly on 6815 khz from April to June 1984. In January 1985, Radio Frecuencia Siete, 7010 khz, added yet another voice to the town's radio scene. With so many shortwave stations, Celendin was high on my list of places to visit when I traveled to Cajamarca department in mid-March, 1985. A look at the stations of Celendin would be a look at small town Peruvian radio. Indeed, broadcasting in Celendin has been a microcosm of broadcasting in Northern Peru. Radio Frecuencia 7 was the newest kid on the block when I visited Celendin. Striking postal workers in the Plaza de Armas pointed me in the direction of San Martin street. Two blocks away, above the door of a typical one story adobe row house, the words Frecuencia 7 were painted in very small black stenciled letters. The roof top antenna was simply a twenty foot wire sloping down from a ten foot pole to the roof. The main business here was not broadcasting, but rather owner Gregorio Sanchez Aruajo's electrical repair shop, located in the front room of his house. Radios, turntables, and tape recorders were scattered about in various stages of disammebly. Old calenders and posters added color to the white adobe walls. The floor was unpainted cement. The radio station occupied a corner in the back of the shop. The entire station was setting on two rough, handmade wooden tables. The fify watt transmitter, about twice the size of a shoebox, had been made locally by a self-taught electrical engineer. Gregorio hoped he could make it more powerful. Beside the transmitter was a cheap turntable, similar to those found in U.S. discount store toy departments. The station's record library consisted of about 100 forty-fives stacked on a shelf. There were no LPs. A microphone and a "console" rounded out the equipment. The console, a little wooden box with three knobs and a couple of wires coming out of the back, looked just like a homemade antenna tuner. There was not even a cassette deck or cassette recorder in the studio corner, making it the first and only station I've seen without cassette capability. Of course, Gregorio could always borrow one of those in his repair shop. Provided he fixed it first. A quiet man in his late 30s, Gregorio pointed out that the station had begun transmitting on January 20, exactly two months before. He and his teenage son were the sole announcers. So far the station was only making a little money, through the sale of communicados (personal messages) and record dedications. What little commerical advertising there was in Celendin went to the more established stations. But Gregorio still had his hopes for the future. "Yes, we are very small. I started out by working as an announcer at Radio Celendin and later Radio Moderna. I learned how to run a small station, and I feel I know enough about the business to make mine the best in Celendin. I hope to raise power little by little, buy new equipment when we can. Eventually I would like to have 1,500 watts and our own generator so we could transmit all day long. That would be a first for Celendin. It will take time, but we will do it." Gregorio was constantly thinking of the alternative: failure. The year before, a friend of his had operated Radio Nuevo Eden, or "New Eden" (this is what Celendinos like to call their green valley). This Celendin station was reported by DXer Juan Carlos Codina in Lima, but never heard outside Peru. Gregorio said it had operated with only fifteen watts, but couldn't make it financially and finally had to close down. On a side street, about seven blocks from the plaza, was a two story while adobe building with a wooden Radio Moderna sign over the door. Inside, the dirt-floored room had a table and chair in the center and a steep wooden stair case on one end. This was the station's reception room, where a staff member took down the communicados (personal messages) that listeners paid to have read on the air. Up the staircase, on the second floor, was the station. I had dropped by this station in the morning, before going to Radio Frecuencia 7, but the door was locked and bolted. Since it only broadcasts in the evening, there was no need for anyone to be there. However, when I dropped by after lunch, teenage announcer Pompeyo Silva Pereya and two friends were waiting for me. They had heard from Gregorio that a visiting gringo was interested in seeing their station. Pompeyo explained that the station was owned by Herbert Palaez Chacon, a businessman who lived in Cajamarca but rarely came to Celendin. Senor Palaez also owned an AM-only Radio Moderna in San Marcos, south of Cajamarca. The station manager, a local businessman, was out of town for a few days. Pompeyo didn't know anything about the station's plans or its brief history. His job was to spin discs and make announcements, but he could give a friendly tour. Upstairs, the eight by fifteen feet room had a roughly hewn wooden floor and little furniture: a table with a manual typewrite and a chair. Posters of Spanish singers adorned the walls. Along the back wall, a window provided a glimpse of the cramped studio. It was as small and stuffed as the other room was empty. A large console, two turntables, and a cassette deck filled a little desk. Records, both LPs and 45s, lined the walls overhead. The DJ barely had enough room to sit down. Through another doorway, the "guides" led me to a third small room, housing the station gem: a 250 watt transmitter. A heavy coaxial cable led the signal under the eaves and to the rooftop dipole. Two beds were the only other furniture in the room. These, Pompeyo explained, were for the announcers. Because the station didn't go off the air until late at night after the power went off, the announcers on duty slept at the station instead of walking home in the pitch black streets. He then smiled and said they were occasionally used for other purposes, too. Radio Celendin wasn't as easy to find as the other stations. But finally, with the help of a storekeeper, I located it on Dos de Mayo street, about five blocks from the plaza. There was no sign over the old wooden double doors. The doors were locked throughout the afternoon, and I realized I would have to drop by in the evening when the station was on the air. When my wife and I arrived about 7:30 pm, the double doors were propped open. A bench and posters making a half-hearted attempt to cover bare studs furnished the entryway. Over the inner door leading to the studio was a beautiful painted wooden sign proclaiming the station to be "a wave of love, peace, and culture". Owner Jose Camacho Villar was spinning discs. The studio was a very cramped little room, about 6x8 feet. Inside, two tables arranged in an "L" were topped with two turntables, cassette player, console, and tabletop transmitter. There was just enough room to squeeze by the table and into the room. Not long after our arrival, an announcer came and took over, freeing Senor Camacho to talk to us, and to sign and stamp the prepared QSLs I had brought along with several reports. He thanked us for our compliments on his beautiful station sign, and pointed out that the station had another motto on its official rubber seal, "transmitting from blue skies of Eden." Influenced by that slogan, one of his announcers started the ill-fated Radio Nuevo Eden. A friendly, easy-going man in his late forties, Senor Camacho noted that his station was actually the oldest in Celendin. He had been broadcasting on and off for more than twenty-five years, whenever he had working equipment and the time. In 1982, after Radio Moderna came on the air, he bought a homemade Peruvian two-hundred watt tabletop transmitter. Before that he used very low powered equipment, and had never been heard (or heard of) outide Celendin. With other more profitable business interests, he still plan to put much effort into the station. For the first year and a half of this station's existence, it was only heard irregularly by a few South American DXers. Then, in December 1984, it changed frequency to 4485 and apparently added a newer, more powerful transmitter. Suddenly it was well-heard in North America. Three months later, it disappeared just as quickly. The DX world learned why when a DXer received a verification letter mentioning that some parts in the transmitter had burned out on February fifth. In the beginning of March it was heard again once, but weakly. When I arrived in Celendin in mid-March, Radio Gran Pajaten was no longer on the air. Walking around town, I discovered the station just around the corner from Radio Moderna in another two story white adobe building. A wooden station sign hung over the locked door. From a neighbor, I learned that owner Milciades Echeverria Puitiza had gone to Lima for replacement transmitter parts. Since that visit, radio in Celendin has continued to develop and change. Gregorio Sanchez's Radio Frecuencia 7 was occasionally heard by DXers throughout 1985, and verified several reception reports. It was last heard in March, 1986. In early 1988 a DXer received a verification letter from Radio Moderna, signed by announcer Gregorio Sanchez. Apparently Gregorio's dream of making Radio Frecuencia 7 the best station in Celendin didn't succeed. At Radio Celendin, Senor Camacho apparently decided that his other businesses needed more of his energies. His station hasn't been reported since December, 1985, when it changed frequency to 5085. In June, 1985, a new station Radio Norandina, signed on higher powered transmitter on 4460 khz. Though not common, Radio Norandina is logged regularly in North America. This new competition probably helped do Radio Frecuencia 7 and Radio Celendin in. Radio Moderna is still there, however, and continues to broadcast on 4300 khz, where it is usually covered by a radioteletype station in North America. As for Radio Gran Pajaten, nothing has been heard from it since that weak broadcast in early March 1985. Apparently replacement parts were more expensive than the owner imagined. Since the fall of 1988, a new station named La Voz de Celendin has been logged on Radio Gran Pajaten's old frequency of 4485. Although well-heard by DXers in South America, it has only been weakly heard in North America. In all probability this is Radio Gran Pajaten's old transmitter. Possibly, the owner finally had it fixed, and put the station on the air under the new name. But name changes at Latin American stations are rare, and my bet is that, in need of cash, he sold the useless transmitter at a bargain price to someone else who had the money to fix it. The real answer won't be known until someone at the station takes the time to answer a DX report, and explains the station history. So, of seven shortwave stations in Celendin, only three are still around today. Radio Moderna and Radio Norandina are probably around to stay, but La Voz de Celendin is so new that I wouldn't place any bets on its survivial. Celendin's stations are not easy to hear. But, if Latin American conditions seem to be good, and its between 2300-0500, try for the active ones on 4300, 4460, and 4485 khz. Besides that, there are still Radio Celendin's 200 watt transmitter and Radio Frecuencia 7's 50 watt transmitters unaccounted for. They could pop up on the air anytime. Celendinos like to start radio stations. 1996 Addendum: Since this article was originally published, the broadcasting scene in Celendin has continued to change. The most consistent and best heard stations for several years have been Radio Norandina on 4460 and La Voz de Celendin on 4485. Like so many other broadcasters in remote parts of Peru, neither of these stations are officially licensed by the Peruvian government. They are, in effect, common law stations - licensed in the eyes of their community. While La Voz de Celendin has stayed on the air despite my predictions in the above paragraph, Radio Moderna has been gone from shortwave for several years. Perhaps the most significant develop in Celendin radio is that in 1995 the town was connected to the national power grid, allowing the stations to broadcast all day long. So, these stations can now be logged during their morning sign-on period as well as during the evening. 2007 Addendum: The use of shortwave in Peru has significanly declined over the past two decades. But, there are still a few dozen stations on the air. For a complete list of Peruvian shortwave stations, the best references are the annual publications Passport to World Band Radio and the World Radio TV Handbook . These are available from various shortwave vendors.